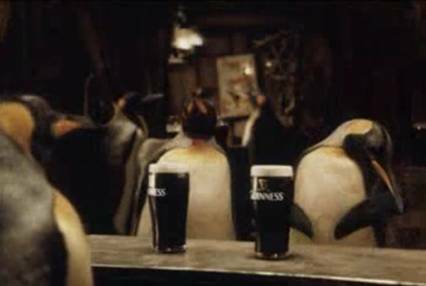 Guinness, as we know, is a dark Irish beer brand, which was advertised in 2006 thanks to two emperor penguins, who are best friends for life. This ad was created by Irish International BBDO (Dublin) with creatives Malcolm Stevenson, Rory Hamilton, Jonathon Cullen and producer Noel Blyne. McVitie's is a Scottish confectionery company brand, known already from the 19th century, but now as a result of company merging is a part of United Biscuits. Penguin image is a part of their chocolate biscuit bars. Here are two TV ads from the 70s and 90s of the previous century. The chocolate biscuit bars are popular with the advertising slogan: "P-p-p-pick up a Penguin! ", which was widely plaid and mocked within Britain and abroad. On April 1, 2008 BBC revealed to the world exciting news on the penguin's ability to fly. The video, where director and writer Terry Jones discovers a penguin colony, which differs from other penguin colonies in its ability to fly. And where do the penguins go? Of course, to the warm tropical lands! Isn`t it a nice explanation of why the seashore of South Africa is full of penguins? Thanks to the performance of computer designers, the story seems true enough even though it`s only a BBC`s 1st April joke. Enjoy the video below and do not believe your own eyes! Argos is a large food trade network in Britain and Ireland with approximately 750 stores. The firm offers a unique option to shop without leaving your home. The buyer can choose from a catalogue and all the necessary food is sent to your home. These advantages then are presented by penguins in funny video commercials, where they bring one, two and even a whole net of fish to their natural enemies - sea lions. In September, 2010 short (only 10-30 seconds) but very efficient commercials were demonstrated. They were created by the company CHI & Partners. The company`s slogan - „Find it! Get it! Argos it!” The ads highlight the benefits of the service - an extensive network, delivery at the most convenient time of the costumer and united delivery prices, which do not depend on the number of units ordered. Coca Cola is a very popular carbonated soft drink all over the world, which uses mainly white polar bears in its commercials but once it had also penguins. A friendly consolidation of two poles in a lively enjoyment of beverages. The Beach Boys “Little Saint Nick” is playing in the background and the commercial ends with the slogan "Give. Live. Love.”. The concept "Arctic Beach Party” was created in 2005 in New York by advertising agency Berlin Cameron Red Cell with creatives Chris Shipman, Izzy DeBellis, Ewen Cameron and producerChris Kyriakos. Carlsberg Danish beer and soft drink manufacturer used penguins and the amazing movements of their wings in 2009 advertising a sports energy drink. The manufacturer of soft sparkling drinks Pepsi-Cola used the compulsion of penguins to fly (at least according to people`s thoughts). This time the hero of the story - adelie penguin. The commercial, which was available to public in May 2009, was created by the New York advertising agency BBDO. New Zealand company`s Bluebird chips were also advertised with penguins in 2007. The original advertisement was created by advertising agency Publicis Mojo with creatives Chris Bleakley and John Pimmer. The penguin doings are accompanied by a rhythmical Run DMC song "Walk this way”. Budweiser American beer brewing company showed penguins as extremely aggressive in a TV`s commercial in 1996. They followed those who bought the then new beer brand "Ice" to take it away from them. The penguins theorised them through the phone at nights, secretly broke into their houses and tried to knock out the door. There were warnings not to talk to penguins. A rather offensive ad - I don`t think that a penguin character really fits here. BMW - who would have thought that the German car manufacturer company will not do without a penguin in their commercials? The company presented a non-slip function of the car in 1995 - penguin`s flappers slip but BMW doesn`t. An advertisement of British sofa manufacturer DFS with the participation of a penguin-Eskimo language interpreter. Wshington Lottery - The Washington gaming company claims that each bird needs to fly , including, of course, penguins. The ad created by Seattle advertising agency Publicis in the West in 2008. Melbourne Aquarium attracts their potential visitors with giant sharks and penguins. The creators of the commercial - advertising agency Magnum Opus. E. Wedel - Polish confectionery producer used penguins that are drifting in a state of zero gravity to advertise "Bird`s milk" candy to emphasize the heavenly pleasure of eating these candies. Advertising agency Delapostparis (Frank Vroegop, Federico Costa) created this advertisement using an animated 3D effect.